As a provider of online therapy, communication apps, and communication devices designed to help those with aphasia, Lingraphica maintains an interesting vantage point when it comes to the improvement of our customers. Not only are we able to "observe" how customers respond to our technology through device trials and our own device User Group in Princeton, but we also receive daily feedback from speech-language pathologists, caregivers, and persons with aphasia. Through these observations and feedback, we are able to draw some general conclusions about what perhaps makes one customer more successful with his/her speech than another. While there are many factors at play when it comes to better communication in someone who has aphasia due to stroke, there are three that rise to the top of our list of observations. Interestingly, and fortunately, these three keys to better communication are ones that caregivers and persons with aphasia have some control over. So what can your clients do to improve communication after stroke? Check out these suggestions. 1) Work with a good speech-language pathologist (SLP) as often as possible. Most of our customers who have aphasia due to stroke work with an SLP to improve their mouth movements/positions, their communication tools, and their speech. Regaining one's voice after a stroke without the assistance of an SLP is possible, but having the instruction and guidance of a dedicated professional, like you, seems to enhance the progress. 2) Find a supportive caregiver or communication partner who encourages your client's efforts to improve. Caregiving is a demanding role for most people, and when a stroke occurs, a spouse or family member is oftentimes thrust into this role overnight. Some people are excellent caregivers; some people do not possess the patience and compassion it takes to fulfill the role. People with aphasia who do not have a family member who can take on the role of caregiver can seek out someone who can be a "communication partner." Communication partners are people who interact with someone who has a communication impairment, like aphasia. We've observed that those who have an engaged, supportive, and encouraging caregiver or communication partner tend to see more improvement in their speech than those who do not. 3) Practice, practice, and then practice some more. Lingraphica offers communication devices, apps, and therapy to those who have aphasia and other communication disorders. However, owning a device or downloading an app is only half of the equation to achieving better communication. The person with aphasia needs to use the tools he/she has. And the more often those tools are used, the better. The willingness to use these tools is a reflection of motivation...and how much someone wants to improve. 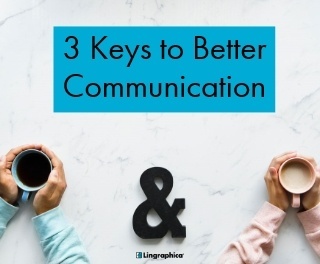 There you have it—our 3 keys to better communication after an aphasia diagnosis. If your clients want to improve their ability to communicate after a stroke or brain injury, we want to help. One of our communication devices might be a good fit for them, and you can guide them through a FREE trial with the device at no risk! So, are your clients ready for better communication? If so, we're ready to be your partner for the journey!